Many of you have been following this blog for years. You know I’m neither a Lefty Liberal nor an arch conservative. I do my best to stay in the middle lane of public opinion and keep politics out of this forum. 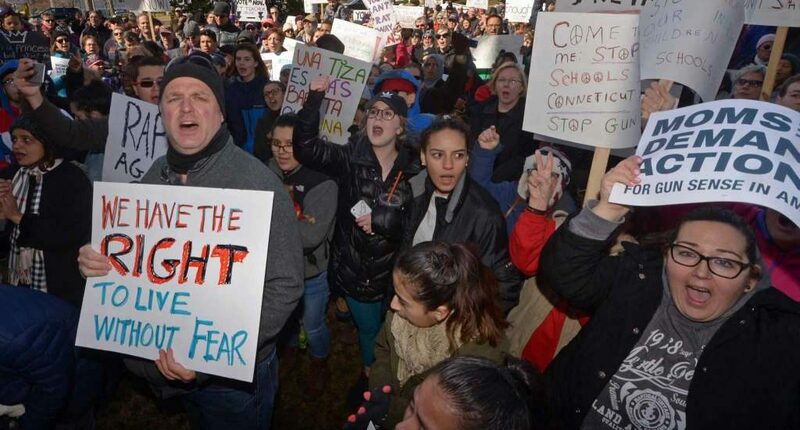 That being said, I proudly participated in our Connecticut town’s march against gun violence last weekend. We have extremely tough gun laws in my home state. We’ve had multiple lockdowns and terror scares at our town’s two public high schools. I’m glad we have tough gun laws and I don’t keep firearms in my home. But I do know how to fire a weapon properly (and accurately). I’m proud to say I learned the right way to treat a firearm growing up, thanks to the NRA’s youth marksmanship program at my summer camp. Again, I’m not a gun owner, but I don’t have a problem with responsible adults using pistols or rifles for protection, sport-shooting or hunting. So, please explain to me why any civilian needs to own a high powered military assault rifle such as the AR-15 favored by today’s terrorists and mass shooters. It certainly ain’t for sport or self-protection. Safety was the first (second and third) priority in my youth riflery program, followed by learning how to focus, control your breathing and relax under pressure. These were all valuable life skills. And if you didn’t take the safety part seriously, the instructors wouldn’t think twice about booting you off the range…no second or third strikes. No parental or social worker intervention. I have two teenage boys. The faces of those kids from the Parkland, Florida mass shooting looked eerily similar to my 14 year-old and his classmates. I coached my son in baseball for many years and our biggest rival was a very good team from Newtown, CT, half of whom survived the Sandy Hook school shooting in 2012. You couldn’t have met a nicer group of kids, parents and coaches, but they’re very close knit in a way that few other teams are. Sadly, tragedies have a way or bringing people closer together. So what’s all this have to do for a blog catering to financial professionals? First, I’m sure many of you have been asked by clients to help them divest their holdings of publicly traded gun manufacturers. And it’s not that easy to do so is it? Ron Lieber outlined 7 key challenges to socially conscious investing last week in the New York Times. It’s not that easy to put a gun maker in your investing cross hairs since most, like Smith & Wesson, are part of broader diversified retailers (American Outdoor Brands). There also challenges of style drift as funds designed to replicate the indexes they track, can no longer do so if several major gun makers and ammunition suppliers and are taken out of the equation. Can the money guys influence the gunny guys? Two of the world’s biggest asset managers, BlackRock and Vanguard, are now among the top shareholders of three publicly traded gun companies: Sturm Ruger, American Outdoor Brands and Vista Outdoor. BlackRock said it would be contacting officials at the three publicly traded firearms companies, asking them about how they were responding to the shootings. Vanguard has taken a more cautious stance. With 20 million clients, the firm said it was unrealistic to cater to such a wide variety of views on pressing social topics. “We believe mutual funds are not optimal agents of social change,” a spokesman said, adding that Vanguard does offer clients a way to screen funds for stocks that they do not want to invest in. Instead of trying to do laser surgery on clients’ diversified portfolios, why don’t we encourage our lawmakers and major institutional investors to pressure gun manufacturers to stop making military assault weapons available for civilian use. We can also ban civilians OF ANY AGE from purchasing military assault rifles and increasing background checks and waiting periods for all gun purchasers. If the nation’s once-siloed intelligence organizations could come together after 9/11, why can’t we do a better job of sharing intelligence between law enforcement, mental health professionals, and school resource personnel to identify people who could be at-risk for using weapons of any type. While we’re at it, we can start looking for ways to reform the earliest stop in the mayhem supply chain–violent video games. My teen boys wouldn’t hurt a fly, but I’d be a lot happier if they spent less time blowing off steam playing Grand Theft Auto and other violent video games with their friends. Whether or not playing violent video games contributes to mass shootings, it definitely desensitizes players of all ages and genders, to violence. Borrowing a page from the tobacco industry, video gaming giants say their products are not addictive, that they don’t specifically target young consumers and they have reams of studies showing their product do not cause harm. If you think you’ve heard this before from the tobacco industry, the soft drink industry and the NRA, you’re not alone. “We discussed the numerous scientific studies establishing that there is no connection between video games and violence, First Amendment protection of video games, and how our industry’s rating system effectively helps parents make informed entertainment choices,” the Entertainment Software Association (ESA), a Washington-focused lobbying organization for the industry ESA responded in a statement. Hmm, same argument different industry. It’s the old “We just make the product, we can’t control who buys it or how they use it” defense. I don’t know how much our town’s March Against Gun violence will accomplish in the long-run, but at least it’s a start. It was an encouraging turnout considering frigid windy conditions on a Saturday morning. Even more impressive was the poise of the half dozen high school students who spoke at the march’s conclusion. They held their own alongside seasoned adult politicians and they were very well informed. Maybe these post-Millennials (Generation Selfie) are more than narcissistic, screen-addicted slackers. Most will be old enough to vote in the next Presidential election and they are a force to be reckoned with no matter where you stand on the gun debate.